Our judging panel is comprised of a diverse assemblage of over 50 wine loving professionals: media heavy, restaurant, retail, and winery experts. More judges per entry than broad-based, broadband wine competitions. Each judge takes copious notes on each entry and takes his/her detailed notes and wine information with him/her. Results and reviews that our gender based. Male and female scores and comments are detailed separately. 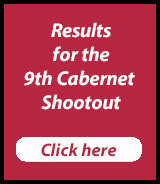 The final judging by at least forty wine professionals is held in San Francisco once all of the wines submitted to the Shootout are tasted a minimum of twice in the preliminary tastings..
Encapsulated results entice and accommodate the wine and food media. The educational and engaging, consumer-oriented, follow-up events, The Pinot Noir Summit and the Cabernet Shootout Challenge for the top wines selected by the judges is allow consumers to taste the top wines and pit their palates against the professional judging panel. The attendees to The Pinot Noir Summit and the Cabernet Shootout Challenge are involved in the process of judging the wines from their perspective: a most memorable and influential experience. Wine writers, wine educators, publicists, sales and marketing professionals, retailers, restaurateurs, and the discerning public love the access to our reviews. 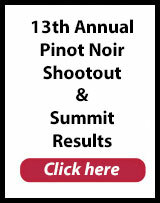 There are overÂ 150,000 references toÂ Affairs of the VineÂ Shootout on Google, over 85,000 on Yahoo and our website views numbered over 500,000 following the posting of our Pinot Noir Shootout results.